I was just visiting looking through your website and I'm searching for a Mustang Shelby Cobra. Preferably an old school version. I have seen some that I am really interested in as well, but I was wondering if it's possible if any of the cars are remote controllled? Something that would have everything, eg: sound, muffler and look as a real sized car but smaller version? It's for a 21st birthday present. If not do you know any stores that do this? Although not a classic Cobra, this cool red Mustang seen above is a 1967 Mustang RTR fastback. 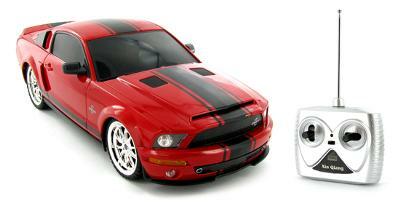 This Mustang RC (radio controlled car, looks quite similar to the "old skool" Shelby Mustang and is remote powered and has a rechargeable 9.6 volt battery pack. While it doesn't have the "sound you are looking for, it does have working headlights and at 1/12 scale, it's a nice size, it's quick and looks great. Here's a link to the 1967 Ford Mustang GT RTR RC Car . Shelby Mustang GT500 Super Snake. You can click on the picture for a larger look at the car or on the blue link for complete information on pricing etc. I need help, where can I get this 1967 Shelby Mustang cover for my 1:10 RC car. I saw once this shell from a website a long time ago. But now I can't find back the web page.